A view of First Street, home to several legacy Little Tokyo businesses. Have you come to Little Tokyo only to find that another of your favorite family restaurants was gone? And instead found a sneaker store or Subway sandwich shop or another Starbucks? 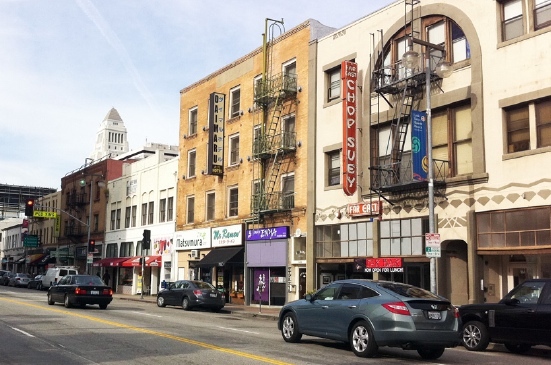 A group of Little Tokyo advocates are announcing the launch of a real-estate investment fund that will seek to purchase and manage properties for the purpose of supporting heritage-based businesses and properties in Little Tokyo. People who are concerned about preserving the cultural legacy and character of Little Tokyo are invited to a public informational meeting on Saturday, Aug. 25, from 2 to 4 p.m. in the Garden Room of the Japanese American Cultural and Community Center, 244 S. San Pedro St., Los Angeles. An update on Little Tokyo and the mission, structure, and operation of the new Little Tokyo Community Impact Fund will be presented, with time for extensive Q&A. Steve and Patty Nagano are retired LAUSD teachers and are now residents of Little Tokyo who have witnessed how businesses are being priced out with increased rents. They are deeply troubled with the long-term prognosis for this community, which has existed for over 130 years. “We strongly encourage everyone with any interest or desire to take control of the future of our historic ethnic community to join us at the informational meeting coming up on Aug. 25,” they said. According to the organizers, the Little Tokyo Community Impact Fund is an “S” corporation and is now ready to accept investment dollars. All investors will receive a less-than-market (but not insubstantial) rate of return while knowing their funds will also be benefiting and securing the future of the Little Tokyo community. Interested persons are encouraged to visit the fund website (www.littletokyocif.com) and to RSVP for the informational meeting.